It was another Saturday like many others where we set out to check the Trail Cameras around the area. The Sambar rut is closing so we try to keep a handle on what's moving around the blocks. I had to replace a camera that had played up on Anzac Day so I set out up this road noting fresh sign heading up the road the way I was going. It was probably less than a km up when I came to a tree across the road which you have to climb around. As I reached the top I noticed a flash of to my right, not sure what it was I listened and sure enough I could hear a deer bolting off through the trees, seconds later further up the road another deer a spiker streaked across with no chance for a shot. As I walked up to the end skid I could hear both the deer, one on either side of the road barking a warning to everything there that there was an intruder in their domain. I check the camera and found it had a problem too so removed it and put the other one I had up. I carried on reaching the ridge top and strolled along enjoying the morning thus far. Suddenly something big and black took off jumping a tree then disappearing from sight, a pig I first thought but after sneaking along a little way I spotted the animal watching his back trail it was a sambar spiker. I run the crosshair over his shoulder but decided not to shoot. The stag run off along the ridge towards the next camera I had to check so I took it carefully and low and behold when I got there the spiker was standing about 15 yards off to the side. I looked at him again through the scope but he was safe this time. I continued on after checking the camera noting a lot of fresh pig rooting along the way. As I got closer to the last camera to check I deviated off my normal route a bit and as I crested the top a deer barked, I looked around a toi toi bush and seen the young hind staring at me, a quick shot and I had a prime eater on the ground. 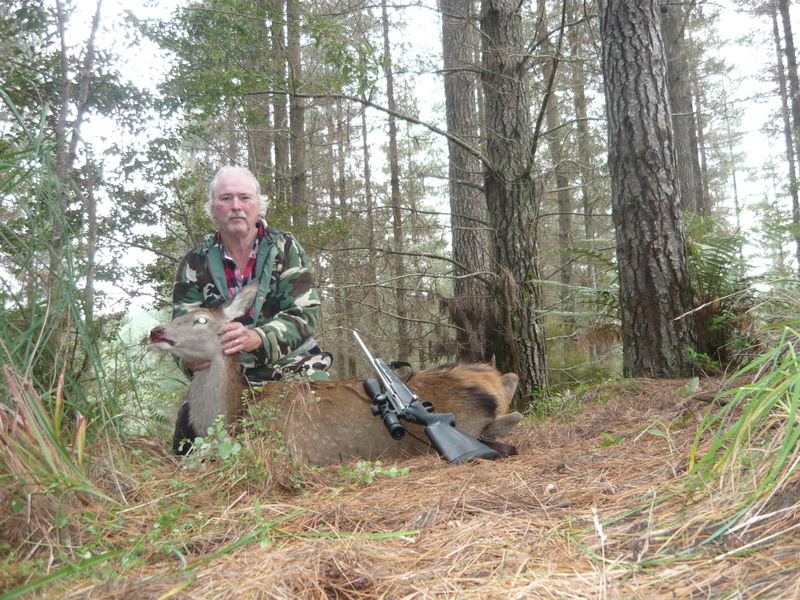 I checked the camera first noticing a lot of pictures of pigs and some deer, 44 triggers in total. I went back gutted the deer then carried it to the road about 20 minutes away. Back at Beeman's we checked the cards and there were some great pictures and videos of some pretty big pigs. The afternoon hunt was in another block that had been showing a lot of sign lately. As we drove up and parked sign was everywhere. Here we split up I did one area and Beeman and Mrs Beeman another. Sign was everywhere but despite this I didn't see anything. Beeman and his partner hunted another road and watched the skid I seen the 9 deer on earlier this year and just before dark when they moved out onto the skid put two deer up which didn't decide to hang around. We both seen truck loads of sign so I think we will be checking that spot out again soon. It sure was a great day out. veitnamcam, Ackley, Gibo and 7 others like this. 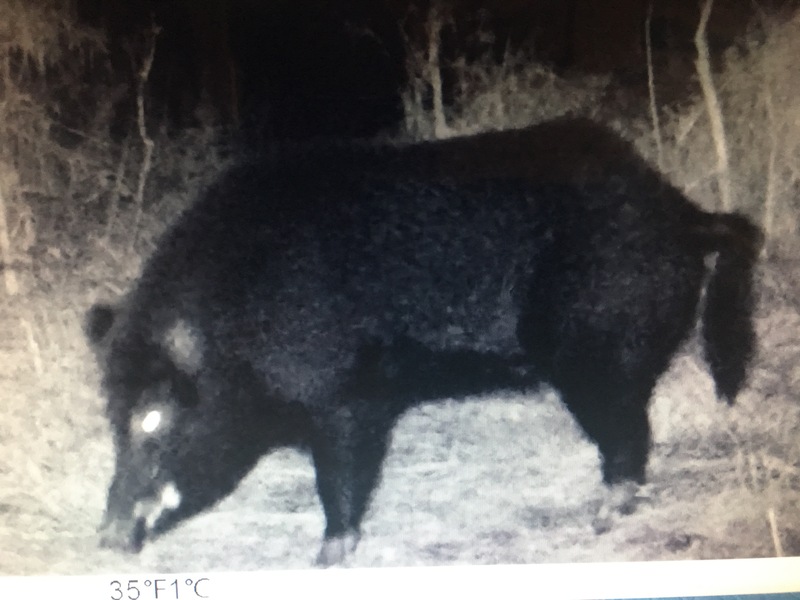 Here is a picture taken off the video of one of the Big pigs running around the camera lines at the moment. BeeMan, Mrs Beeman and CattleX like this. Solid pig Brian! Sounds like you guys are in the thick of it, good times! !